Today was the last appointment where the doctors will ever talk about our little girls. This appointment was meant to happen on May 25th but was pushed back. It was a long weekend that week and the clinic is always extra busy and it made sense. Even though they did this for my feelings it hurt me. Since the day after the loss when I had called to make this appointment 6 weeks in advance I had been preparing myself to hear the reason why I lost our little ones. During those weeks my emotions have moved in and out like the tide, moments of true upset where everything that happened was because I was not a good enough person to deserve them, to being at peace knowing they will always have each other. Then add on top of that all the love shown to Merritt and I. The love still makes me cry the most. We arrived to the clinic much earlier than we needed, we still haven’t really figured out travel times from our new place. The clinic was quiet, they do this on purpose, having women who have had a miscarriage come first thing in the morning to avoid the potential upset. I thought I could handle this appointment, I had managed to hold myself together the week before, we had gone to the Antenatal unit to deliver ‘Thank You’ cookies and cards to the nurses, and other staff who were apart of the delivery. They as individuals have lived through people's worst days and still come back every day wanting to help more and the least I could do was thank them. It was different though, arriving at the clinic and sitting in the waiting room thinking about all the thoughts I had had when at our first appointment, knowing our girls were high risk but for some reason I like a child believed that because I was seeing a specialist all would be alright. I made it into the actual exam room before I broke down. The checkup was quick but felt long. We met with our nurse who had been with us since week 12. She asked how I was doing mentally and physically, how Merritt and I were doing. This appointment was marked by me as a final milestone in healing, the moment where we would learn as much as we possibly could and one way or the other find comfort in the information given. Once we were done with the nurse we were moved on to meet with the doctor. The apologies for our loss is how we are greeted by those who know but have not seen us since before the miscarriage, the doctor was no different. This is when we are told that our amnio results showed two perfect little girls. The doctor explain that the above average nuchal translucency, that was the reason for being sent to the clinic, was most likely due to the one twin supporting the other or a crossed vein between the umbilical cords. He also tells us that without having done an autopsy of the girls to rule out heart defect that the cause of miscarriage was due to them being Monochorionic Monoamniotic twins with evidence of cord entanglement. We lost them for the reason that made them high risk. Out of all the upset there is this moment of ‘okay’, followed by finally letting go of every thought I had running through my mind for the last 6 weeks. You are so loved my little ones. I think of you every time I touch my belly knowing you are no longer there. I think of you when I pass the room that sits empty because it was meant to yours. I think of you every time I sing because those songs are meant for you. All I got to keep that was truly yours were your footprints that now sit on my feet so you can walk with me. My dear sweet little ones, you have touched so many hearts.. I will never get to see you run through the grass chasing each other or hear your laughter as you run through the house, but I hear you in my heart and it is beautiful. Am I doing this right? What happened anyway you look at it was a big life event but my brain keeps flipping the switch between being functional or about to cry. The sensation of crying is now at the point that is feels like the sensation to sneeze where my body and brain prep itself for the momentary outburst. What happened to me was called a missed miscarriage, the fetus no longer had heart beats but my body had not clued in. This kind of miscarriage so late the in pregnancy is not terribly common, however if you Google it you will be amazed at the number woman who can speak to having to happen to them. The internet has a strange way of making something rare feel like it is everywhere, but that is because it is an outlet. I am not certain that I am grieving properly... I know there is no right or wrong way but I feel I am being treated as if I am a tea cup with a chip in it that no one is quite sure if it will fully crack if the water is poured too hot. I am told I am brave when I speak out about what has happened. As a griever I am a doer, I need to have my hands busy so that while I am thinking of what I am upset about I am also in motion. This can come off as being emotionless or as if I am cutting people out but in this instance other then my husband's emotions I don't care about anyone else. This can sounds harsh but this loss is not a everyday loss. We are born to die, it is inevitable. My little ones skipped a step and now I suffer with the loss. I sometimes wish I could allow others inbut I am not here to support them in their grieving this time. Subsequently due to my current state I have been able to stand back in the moment of condolence and acknowledge that some things should just never be said. In these instances a simple hug and an admission that you do not know what to say is much better than just speaking. I miss the little flutters in my belly from my little girls rolling awkwardly over each other, but I sit here cognisant of the unknown thinking "what if this was for the best?". We will not received the finale results from the amnio until May 25th where we will find out if there were any identifiable genetic defects that would have caused termination. There are so many other what ifs that there might not be any answer for but was it better that I lost them now then to lose them after birth? This is a very selfish comment to make but the thought of bringing such innocent life into the world only to have it suffer on its way out hurts just a little more. But then am I fantasising the idea that they gently slipped away while inside of me, that they felt no pain? But what if there was nothing genetically wrong with them and in fact I did lose them because of cord compression, a risk of my little ones being MoMo twins. Then comes the big, what if I lost them because I decided to do the amnio testing. So many 'what ifs' that I messaged my husband this week asking him if I was a monster because I couldn't keep them alive. This is why the will be my last post until the 25th and the doctors have tried to explain the most probable cause and I can close the door of the these questions. Sometimes I can be impulsive, this is why I married someone who counteracts this tendency and or keeps me on a semi strait line...sort of. The decision was simple, sitting on the couch crying about recent events (there has been many tears and I don't think they are done yet) all of a sudden I had this idea. The only thing from our girls we were their feet prints which made sense that I would get them tattooed on me. At first I wanted their little feet on the bottom of my feet. This kind of tattoo is possible but requires above average maintenance as the skin on the bottom of your feet is different like the palms of your hands. The idea of walk their feet off of my feet made me sad...because anything can make me sad at the moment so I took the advice of the tattoo artist and went with the top of my feet. Getting a tattoo of any kind for me holds meaning. My first tattoo ever was a feather on my back designed by my dad at my request for my 18th birthday because he didn't like the idea of me having a tattoo. When I know what I want there is no stopping me from getting it but these little feet were different. Until this point I had only had symbols or quotes tattooed on me that held meaning and now without a second thought I was going to have these little feet prints of my daughters tattooed on top of my feet. the artist was amazing, she put up with the crap scan I brought in because I should have known better and asked my husband to remove the pink back ground of the card the feet were stamped on. 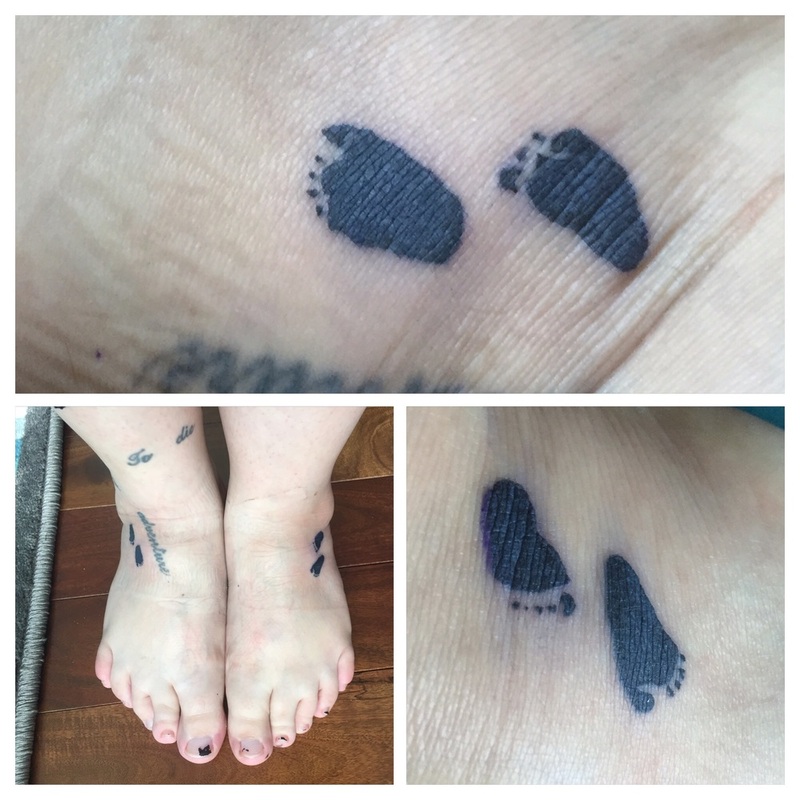 Not to mention my impulsiveness of knowing it would work out and my husbands nervousness of thinking I was rushing into this tattoo but the artist understood, she saw how much it meant to both of us and worked with us every step of the way to make sure they were the actual size and had the unique characteristic of each foot print. It wasn't until the next morning looking at the little toes on my feet that I started to break down. When I was a little girl I would stand in my dad's feet as he would stomp around the house pretending we were a monster. It hurts to know I will never be able to physically do this with my own daughters but their little feet tattooed on my feet provides an odd comfort. As time passes I have broken down this loss and rationalized it as much as possible but my mind keeps getting stuck on the thoughts I had for the future that now will not happen for my little beasties. Obviously this makes me cry a little sometimes and a lot other times. I think about a different future now. A future where maybe we do end up having a successful pregnancy where I am explaining to a little person the meaning of the feet marks on my feet and of the sisters they will never meet. Or there is the other possibility the my body becomes a memorial for all the little ones lost. Then my thoughts begin to spiral with the thought of being preagant again and if it is a single pregnancy it makes me sad to think of how alone that little one will be but if it is a multiple pregnancy how could I survive outside of the world of panic and upset as if buckling into a roller coaster ride if am terrified of. Like I said, my thoughts spiral. Everthing I write here I have already said to my husband. He is the one who holds me tight as my mind explores the rabbit holes of possibilities as I try to think of every potential outcome and it's probability. Putting the words up here just helps wth getting the crazy out. So here I am, thinking about new futures while honoring the little ones that took a step to the left and are no longer apart of my path but forever apart of my heart. Little over a month ago I wrote a post that I didn't put up titled "Wasn't This Supposed To Be Fun". In the post I document where I was in my pregnancy and everything we had already gone through in regards to scans and tests and waiting on results. I felt back from publishing it because I was afraid of telling people I was preagant and then miscarrying. I find I am stuck on the reality that "I was pregnant." Miscarriage is a common thing that most people do not talk about and those that do typically experienced it later in the pregnancy which carries it's own unique emotional scars for everyone. Where I am most stuck is in the fact that my body had not caught on to the loss of life that had occurred but somewhere in the back of my mind I was acknowledging it before the anatomy scan in strange comments to people. I then think about everything that could have gone wrong and how it was my fault but I will wait until my appointment in May before assigning all the blame to me. Truthfully I am lonely, for 5 months I would read weekly update on their growth progress and fret over the fact that all I wanted to eat was olives and milk with grapefruit and what kind of messed up taste preferences it was creating for them. I would talk to them and sing to them, I would rub my belly somethings feeling more connected to the little beasties. It sounds insain but suffering through the morning sickness had become a sign of life, I feel dumb for thinking that when it was easing up in that last week before the scan that I thought it was because my body was moving into the next stages of pregnancy. There are a lot of little thoughts like that in the back of my mind and once I start thinking about them I spiral.... But isn't that normal? I have read all the pamphlets on loss and followed the Google rabbit hole. I wanted to go back to work this week but there were concerns about me taking enough time off. It is amazing to have an employer who is willing to let me have whatever time I need but what good does it do me to sit in an empty house by myself? Logical question, but the problem that I need to come to terms with is that I need to learn to be alone. I may have only been pregnant for 5 months but I had built up a life time of expectations of having two kids running around me for the next ten years or until they decided to disown me and now I can't even be left alone in the house for a week because the thought of being with myself is terrifying. I am functional, I am logical and I could make it through work with minimal tears and get on with life, but what good will it do in the end trying to put on a brave face for myself. I might look tougher but my husband is the strong one. In the past week and a half he has been at home with me, ready with open arms every time I have a break down. He tells me it is okay and I believe him because his words hold love and comfort. He would have made an amazing dad and hopefully will someday, but that thought breaks my heart and I have started crying again. Now I sit here with a few tears rolling down my cheeks thinking about the future. We want children but could I survive this happening again, could he? People have been making comments that even with the loss out our little girls we are still parents, I don't know why but this bothers me. I was never called mommy by my child so do I have the right to say I was a mother? Right now my heart says no, I was a woman who was preagant who miscarried at 19 weeks and even though I call them my daughters it only feels right because I am able to speak the words aloud. 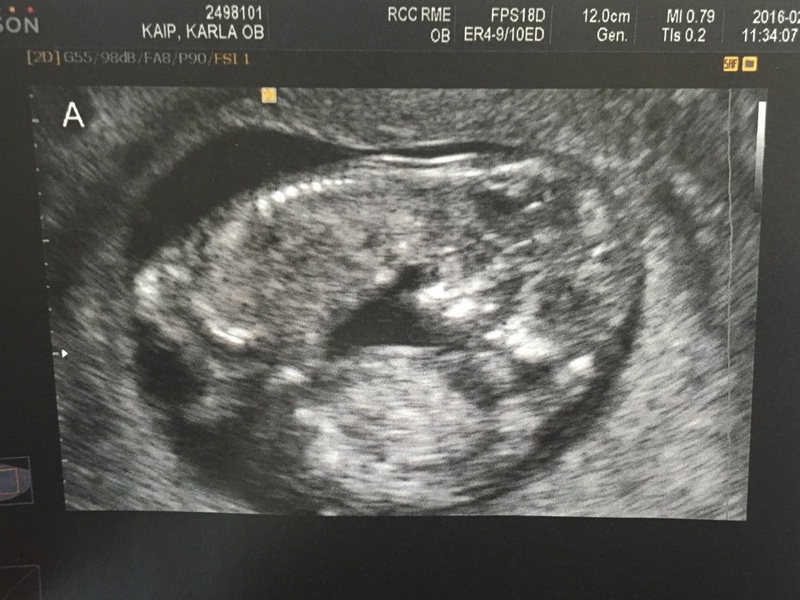 On December 26th my husband and I found out that we were pregnant. We had been trying for almost 5 years to conceive and had spent a year going through cycle monitor through a fertility clinic. The cycle monitoring included daily bloodwork and lots of ultrasounds to watch the development of my eggs for the clinic to let us know when is our most optimal time to conceive. Because we conceived while being patients at a fertility I was scheduled for an ultrasound at 6 weeks where the tech was able to identify two distinct heart beats. I messaged my husband right away to let him know the amazing news. Then I sat down with the doctor who tried to explain to me that twins can come in many forms and I just so happened to be pregnant with MoMo twins. It sounded cute until I actually found out what it means. MoMo twins stand for monochorionic and monoamniotic, which very simply means identical twins growing in one placenta and one yolk sac which takes twin pregnancy risks and takes it to the next level due to cord compression and strangulation. Thanks to the internet and too much and too little information being available I spent about a day crying about the fact that there was no way I could protect them from themselves essentially. So with knowing the increased possibility of miscarriage I came to terms with the fact that while I was pregnant I would give them the best I could... which when I wasn't passed out on the couch from exhaustion or with my head in a bucket involved a lot of singing to Queen. I went back to get another ultrasound at 11 weeks where it was identified that one of the fetuses had an above average Nuchal Translucency. This added a new layer to the high risk which took me out of the hands of my regular OB and placed me in the hands of the doctors at the Special Pregnancy Clinic at Mount Sinai. If you don't know already an above average Nuchal translucency can be an indicator of a genetic abnormality in a fetus. Funny thing was is that they only saw signs of this in one and not the other. By this point we had only told a few people, mostly those who caught on to the fact that I had the face of a pregnant woman. Adding another risk into the mix made me nervous of telling many other people which I think is a natural response. By week 13 of the pregnancy I had my first ultrasound with the special pregnancy clinic. This was the first ultrasound that my husband had been to, and the one where the little beasties inside of me misbehaved the most basically sitting strait up so you could only see the tops of their heads and flailing limbs. They found the same thing the fertility clinic had seen, an above average nuchal translucency. This time the doctor sat us down and went through the list of everything that could be done from testing to termination. Again I cried for about a day and then decided it was time to tell family. We went back a week later to have another Ultrasound and let the doctors know our choice. We wanted to know what was going on with the now embryo's but did not want to terminate. We just wanted to plan for the future. We did blood work first that came back inconclusive but had also scheduled an amniocentesis for week 16. We knew the risk doing the amniocentesis but since the twins were in the same sack we would only have to do it once. On April 12th I knew it the moment they called for a second tech to come into the room that something was wrong, and when the third tech came in it was the final confirmation. "I am sorry but we can't find any heart beats." I called my husband and told him and then made my way to the special pregnancy clinic to review the results and next steps. I sat in a waiting room filled with pregnant looking at them with envy trying not to cry. Once my name was called I couldn't hold back anymore, I managed to mumble to the nurse that had called my name that there were no heart beats and was whisked away into another ultrasound room to wait for the doctor and husband. We knew from the beginning that this was a possibility. But I was on the verge of 20 weeks and we thought we were out of the danger zone until I hit my third trimester. The doctor humored me and did one more scan and there was no sign of life. From there we moved on to options. No matter what they had to come out but I could choose between having them surgically removed which would involve an invasive surgery where they would dismember the fetuses and remove them vaginally or to have my body be tricked into going into labour and delivering naturally. We went for option B. From there it only took 3o minutes for a privet room to be secured in the Antenatal Unit at Mount Sinai. We were assigned a day and night nurse as the process would take about 24 hours for the medication to trick my body into labour. These woman were kind and amazing, I could never say enough kind words for what they did for my husband and myself. It was explained that the medication would be inserted vaginally and I could expect to have 6 doses. We were also given a list of things that could happen once they were delivered but with no pressure on making any decisions until we were ready. We sat there wondering if we should name them. Knowing the pregnancy was so high risk I had made a point of not wanting to purchase anything or having names really picked out until they were born. It was a weird way of making sure that incase this moment that we were living through did actually happen I wouldn't have to go home to a house filled with items for little ones who would never get to come home with us. By 9:30pm on April 12th they were administering my first dose and was told to expect some cramping. By the second dose I was allowed to use the self administered pain medication and went through a very restless night of cramping and two more doses being administered. We saw the doctor twice, once in the morning and once in the early afternoon to be told that my cervix hadn't dilated enough. by 3pm on April 13th I woke up from a nap feeling like the pain killers weren't working anymore and my back really hurt. From there it didn't take long for me to realize that something didn't feel normal and pulled the emergency cord out of the wall. There was no pain, both babies and the placenta were delivered in under ten minutes. The nurses were like bee's buzzing around me each know their next steps as my body just went through the natural motion of giving birth. Because everything happened much more quickly than expected all I knew at the point of delivery was that I wanted their hands and feet stamped but I didn't know if I could look at them. The Nurses took them away to get cleaned up incase we did want to see them. They were little girls, and we named them Archibell and Ferdinand. The nurse came back into the room with a memory packet and a teddy bear that had been donated by a family that had lost their own little one. 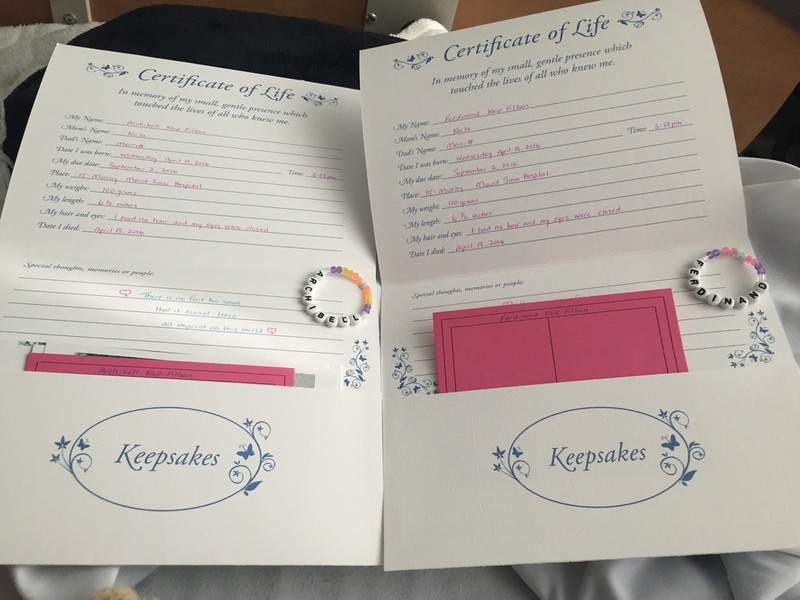 In the packet are two cards for each of our daughters with their names and weight written down along with loving sentiments from the nurses, each girl had their feet stamped on a pink card along with infant bracelets with their names that the nurses had made and a few photo's. In that moment looking at the pictures I have to see them, how stupid was I that I thought that I could carry them for 19 weeks, deliver them and then never meet them face to face. They were both so tiny bundled together in pink blanket that had been hand made with love by a complete stranger that knew they would need something to keep them warm. I cradled them in my hands and felt at ease and then handed them to my husband and watched his heart break. He had spent all night supporting me and now it was my turn to support him. I kissed our little ones and we ask to have a naming ceremony and a blessing. Once the blessing is complete we are left with them for the final time. Words do not need to spoken aloud anymore as we each tell our little girls how much they are loved and always will be. I don't know if you know this about me but I love to create! That was the entire purpose of this blog, to share with others the things I create. The only problem is that I am only sharing what I make and not the experience of making with others. The past week has been a whirlwind of running around. It is not easy putting on an event and when you have people who are willing to lend a helping hand especially when you didn’t think you needed one it is only right to say thank you in one way or the other. I like to say thank you with baked goods! What could be more of a heartfelt thank you then home baking a batch of cookies or cupcakes to share with those who shared their time, experience, and talents.